gallery openings, festivals, clubs, and private functions. 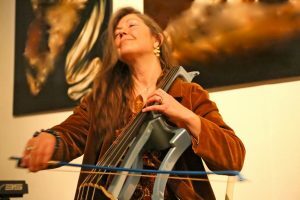 Using sampling and looping technology, Emily has developed an exciting and innovative program of new music for the cello. (Wedding ceremony)Emily played at our wedding ceremony back in September and put together a beautiful arrangement of Chasing Cars for my wife to walk into. She was very professional and even better that we had expected, it really made our day perfect. Our only regret was that we didn’t ask her to play for longer! We were so happy and can’t thank Emily enough! (University of Exeter Medical School graduation)Beautiful music played on an amazingly cool modern cello. Just the right backdrop to our celebration event on the lawn at St Luke’s in Exeter. ‘Sisters in the Forest’ – new looping cello composition 2017 inspired by a Survival international moving account of two sisters – last surviving members of an Awa tribal community in Brazil who having been cured of TB ran away from the reservation where they were told that they could now live and disappeared back into the Amazon forest. Emily’s unique performance was exceptional. She was warm, fun and accommodating and our experience was utterly pleasurable. We were delighted and mesmerised as she transported us into memories. 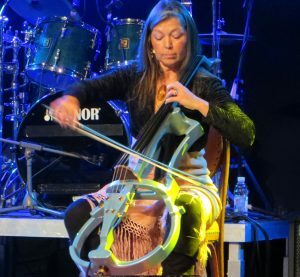 For international bookings the electric cello travels in the hold of a plane and this helps with budgets for international bookings. Check the box and stay in touch with Emily’s newsletter. Over the last few years Emily has established a strong reputation with her unique solo production. “Music from Out of the Blue” Equator WOW Festival, Women of the World, London. 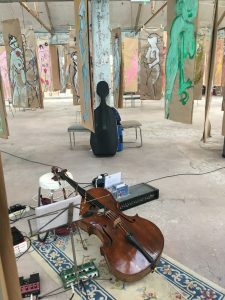 “Bach, Burridge & Into the Amazon” Hayle – Rural tour venue Cornwall. “Bach, Burridge & Into the Amazon” Rural Tour – Various Venues Dorset. Promoted by Dorset Artsreach. 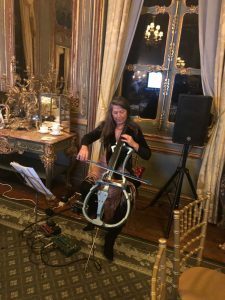 “Music from Out of the Blue & Into the Amazon” Clarence House, London.” Start – A Garden Party to make a difference” Organised by The Princes Foundation. “Bach, Burridge & Into the Amazon” Warneford Chapel, Oxford. Promoted by Oxford Contemporary Music, ” Into the Amazon” Ashleywood Farm Music Festival, Dorset. “Bach & music from Out of the Blue” McQueen’s Club, London. “Out of the Blue & Into the Amazon” Rivenstone Festival – Dartmoor. Main Stage. “Into the Amazon” in collaboration with the photo exhibit “Heart of Brazil” by international photographer Sue Cunningham. Brazilian Embassy in London. The first performance “Bach, Burridge & Into the Amazon” Butley Priory Music Series, Suffolk. “Music from Out of the Blue” Hindon “Peace wins Japan” private concert. “Into the Amazon” ‘out reach” performance. Warneford Hospital, Oxford. Emily integrated within the performance a storytelling approach to the performance as she related her experiences of living with tribal people in the forests of Brazil. “Bach, Burridge & Into the Amazon” Harcourt Arboretum, Oxford. Production – Oxford Contemporary Music. Donhead St Mary Church, Dorset. Benefit concert for the Xavante Tree Nursery initiative.